Hey guys. I've really gotten into spriting, so I need some criticism. So far, I've only made part of me. I'm making it off of the Zodiac sprite. Coments please. making the background black would be better for the eyes..
and the damaged frame has the hair on the right instead of the left.. It looks like you're recoloring all the gray clothing (shirt + jacket, shoes) one by one. Why not download and use Zodiac's Palette Editor? You could then get those grays changed in one clean sweep to dark teal in about 10 seconds. Good luck! There ain't no gettin' offa this train we on! 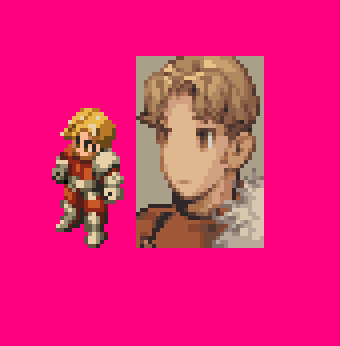 The Marche sprite off of the main site's sprite database is messed up and some places, and I decided to fix those mistakes. Here you guys go. This needs to be fixed, heavilly. And since critting is too hard given the amount of stuff to do, here are fixes I did. Um. That's looking great Kagebunji, I love the hair but, he isn't suppost to be wearing a jacket, he's wearing a shirt. I'm no spriter, but the two blues on the original seem to clash with each other. That'd be a start, I think. Bare chest just makes him much more badass. Well, you can always change it back to a shirt, but it will most likely be flat. Also, you need to work more on the portrait, cause shirt is totally flat, and those dark outlines just add in to the effect. Well, I wanted to use this fix for something of my own, but yoy can feel free to use it. Thanks Kagebunki. I'll be sure to use it. Using Kagebunji's Sprite, I finished the sheet. Unfortunatly, the image apears like crap in the pal editor and won't work in SHISHI's Sprite Editor. Finished my first sprite thanks to Kagebunji and Lijj. anyway i think using kage's suggested palettes would be better? Thanks Kagebunji. I'll keep you all updated.